The site of Um Lakis in southern Israel is known among archaeological circles only for the fact that here William Flinders Petrie conducted the first excavation for the Palestine Exploration Fund. He was trying to find the ancient city of Lachish. 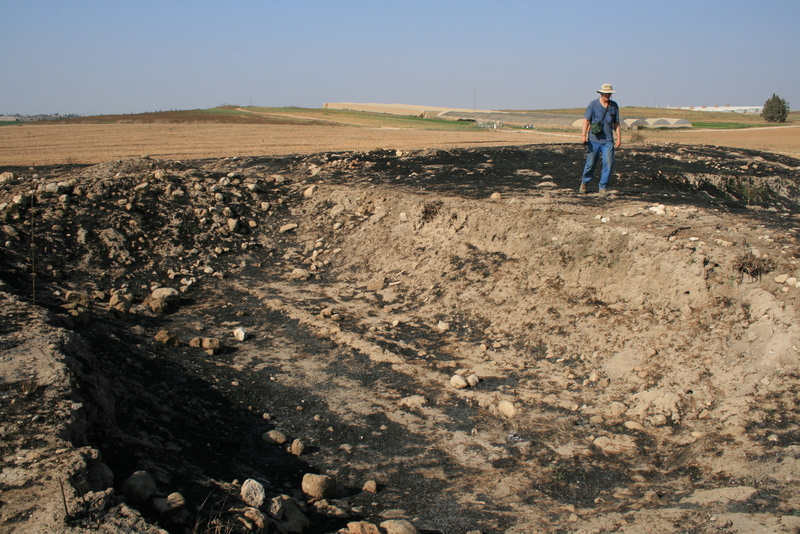 Due to the similarity in names he started at this low mound, but soon concluded that the pottery could not relate to the city mentioned in the Bible and Assyrian records. He therefore moved to the more promising site of Tell el-Hesi nearby. Um Lakis was settled during Byzantine times. But we know little about this settlement. No systematic excavation has been carried out to learn more about the lives of the people who lived here in the first millenium of our time period. And I think that the clues that lay there for centuries have been severely damaged. 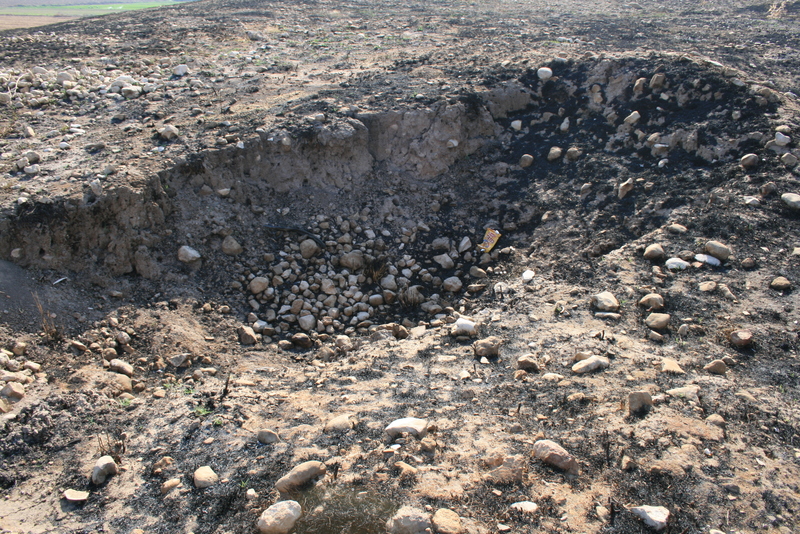 The last time I visited the site (2012) we found evidence of large-scale looting. People had brought in machinery and dug trenches into the mound, probably looking for treasures to sell on the antiquities black market: coins, lamps, small juglets – antiquities that may have been preserved completely. They don’t have great value, but enough to warrant some earthworks it seems. The wanton excavations have destroyed something of great value: our access to past lifeways, the heritage of those who lived in this place over a thousand years ago. That has been lost and cannot be replaced. Of course, archaeologists can still do something with the site. Of course, there are other Byzantine sites. But our understanding of past lives will be poorer, our understanding of that place will be less complete, because someone wanted to make a few bobs. I often get confused looks when I say that I am an archaeologist and explain that I will not keep anything of what I dig up. It will go to some museum, some authority. If I am lucky I will study the artifacts for some years, I might even work at restoring them, but they are not mine. I will not display them in my house or sell them for a good price to a collector or dealer. Archaeology is not treasure hunting. In a sense it is the opposite of it. For we do not excavate to keep, but to share. It is not about possession, but about understanding. Sometimes archaeologists forget that, too. Some will have small collections, others will be so possessive of their knowledge that they do not share. After all, knowledge may give us an advantage: more prestige or an academic posting. It will always be difficult to defend archaeological sites against looters. But we have to be aware of the trade that fuels this looting. If we buy antiquities (especially on the black market) and support institutions that have unscrupulous procurement policies, we indirectly support looting. And unfortunately it also requires strong government enforcement. For the people who are involved in the antiquities trade, are often also participants in other crimes. While some antiquities dealers trade in the most professional manner, nevertheless the whole mindset of amassing private collections can add to the black market. I would want to know more about the people who lived at Um Lakis. Others would too. But somewhere someone has a few coins and a few oil lamps, which were dug up at Um Lakis, and he does not know where they came from, does not know the context, is not interested in the people who used them. But it adds to his collection. 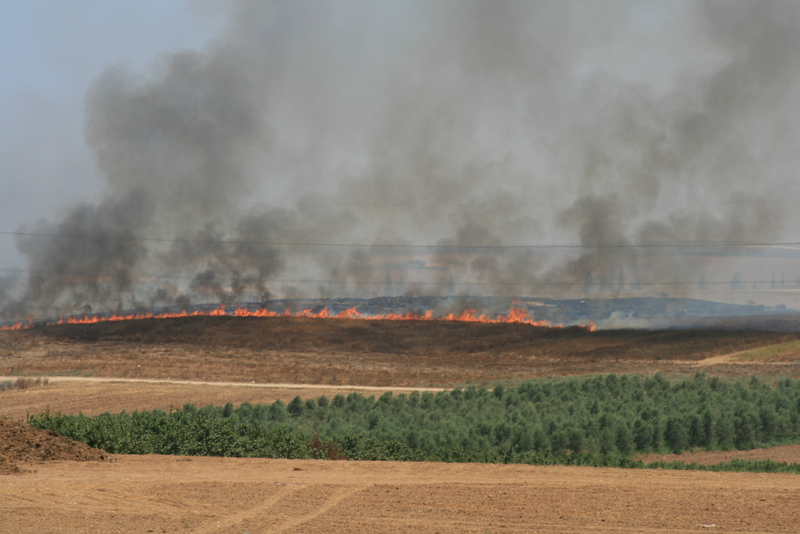 Picture of Um Lakis when the vegetation on the mound was burned. This entry was posted in Archaeology, artifacts, destruction, Discussion, Heritage and tagged Archaeology, Byzantine Period, Heritage, Israel, looting, Palestine. Bookmark the permalink.